Challenge yourself on this iconic trek to the summit of Mount Kilimanjaro (5,895m), the highest point in Africa, following the less-used and scenic Lemosho route. Extend your holiday with some superb game viewing in three of Africa's renowned national parks and conservation areas - Tarangire, Lake Manyara and the stunning Ngorongoro Crater. Our Kilimanjaro adventure starts today in the peaceful surrounds of our comfortable pre and post trek accommodation in Moshi - the Weru Weru River Lodge, from where there are great views of the mountain. Depending on your arrival time, you can relax by the pool before your briefing with the trek leader, who will provide you with the essential information for your trek to the roof of Africa. After a drive through farmland and plantations we reach the Londorossi National Park Gate on the western side of Kilimanjaro. We continue from there to the Lemosho roadhead at 2100 m from where we start our trek up the mountain. We will climb steadily through the lush forest of the Lemosho glades to reach Big Tree Camp (2780 m). Porters will assist throughout the trek carrying your trek kitbag. You only need to carry what you will need for the day - waterproofs, camera, water bottle, extra fleece, sunhat, packed lunch and three litres of drinking water. Please note that drones are not permitted in Kilimanjaro National Park without a permit, please refer to the equipment section of the trip notes for more information. Today's seven kilometre trek is expected to take approximately three to four hours with an ascent of 680 metres. Today we trek across a plateau of grassy moorland and heather scattered with volcanic rock formations. Our destination for today is the camp at Shira One (3,500 m), from where there are often views of Kibo Peak, seemingly floating on the clouds. We gain a reasonable amount of altitude today and parts of the route are fairly steep. Today's eight-and-a-half kilometre trek is expected to take approximately four to five hours with an ascent of 720 metres. Today we have the chance to view the Northern Ice fields from the western side of the mountain with some unusual views of Kibo. Our steady climb across the moorland of the Shira Plateau will help with acclimatisation and we enjoy great panoramic views. Our tents will be set up for us at the Shira Two Camp (3,900m). In the afternoon we will take an acclimatisation walk to the junction of the trail to the Moir Hut. 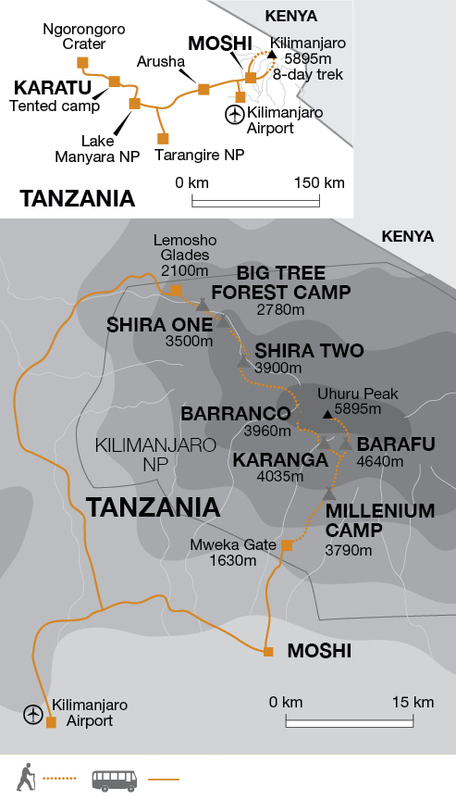 The eight kilometre trek between the camps at Shira One and Two is expected to take approximately five hours with an ascent of 400 metres. The afternoon acclimatisation trek is for an additional one to two hours. Today's walk is longer and perfect for our acclimatisation as we will ascend to a high point of 4640 m before descending to a lower altitude for the night. Our trek starts with an ascent with far-reaching panoramic views, walking in to the climatic zone of the upland desert and on the lava ridges beneath the glaciers of the Western Breach. We reach the distinct pinnacle of the Lava Tower (4,640 m), our high point for the day and a great place to enjoy a leisurely lunch. In the afternoon we make a steep descent to our camp for the night, located in the base of the Great Barranco Valley (3,960 m), sheltered by towering cliffs but with extensive views of the plains below. Today's 10 kilometre trek is expected to take approximately seven to eight hours with an ascent of 740 metres and descent of 680 metres. Our trekking today starts with a steep ascent of the Barranco Wall, a rocky cliff almost 260 metres high that is believed to have been created by a huge landslide around 100,000 years ago. The trail wends its way up the 'Wall' and there are sections of what could be termed as light scrambling where you will be pulling yourself up over the rocks and it's easiest to put your trekking poles away. You don't need any technical ability and we will take it slowly. The climb leads to an undulating trail on the south eastern side of Kibo providing us with great views of the Southern Ice fields, if we are lucky with the weather. The terrain ranges from volcanic scree to pockets of lush vegetation as we make a descent into the Karanga Valley followed by an ascent to our campsite at 4,035 m. The valley is the last water point on the approach to Barafu. Today's six kilometre trek from the Barranco Valley to Karanga is expected to take approximately four to five hours with an ascent of 360 metres and descent of 185 metres. This morning we make a steep climb out of the Karanga Valley following an easy path on compacted scree constantly gaining altitude with good views, until we reach our camp at Barafu (4,640 m). This afternoon we rest in preparation for the final night time ascent, and plan to get a very early night! Today's six kilometre trek is expected to take approximately four to five hours with an ascent of 605 metres. Today we make our final ascent to the summit at 5,895 m before descending over 2000 m to our last camp site. It is undoubtedly a long and strenuous day, particularly with the high altitude and extreme cold. We plan to make a midnight start as at this time the scree and potential snow are still frozen and our aim is to have summited and descended before the top layer of scree becomes wet and slippery. Our path zigzags up the scree and after passing Rebmann Glacier, we reach Stella Point (5,685 m) on the crater rim. Although at times you may be able to walk for only 10 paces before you have to stop and rest, there is no doubt that it is all worth it when you reach the top. From Stella Point we continue around the crater rim to Uhuru Peak, the highest point in Africa at 5,895 m. After time to enjoy your achievement and take those all important photographs at the famous summit sign, we descend back down the scree to Barafu Camp for a rest and something to eat. It's then a virtual continuous descent down to the Millennium Camp at 3,790 m where the air feels positively oxygen rich in comparison to where we have just ventured! 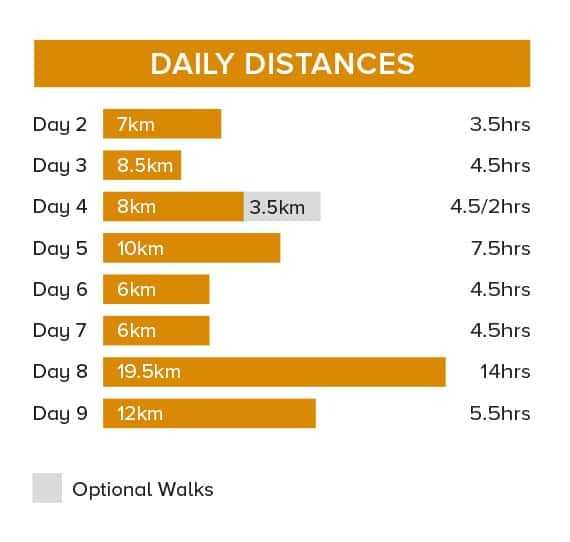 Today's walking totals 19.5 kilometres and is expected to take up to 14 hours. The trek from Barafu Camp to Stella Point is an ascent of 1,045 metres and will take around five to six hours, with the hike from here around the crater rim to Uhuru Peak (additional 210 metres of ascent) taking another one to two hours. The trek down from the summit to Millennium Camp, (a total descent of 2,105 metres), is expected to take approximately five to six hours (excluding the time spent resting at Barafu). After a well-deserved night's sleep and rest, our final day on trek takes us down through the lush beauty of the rainforest, enjoying the increasing warmth and richness of the mountain air. The trail end is at the Mweka gate (1,630 m) from where we travel by road to Moshi and back to the comforts of our lodge. We will have a well-earned lunch on arrival back in Moshi. Today's 12 kilometre trek is expected to take approximately five to six hours and is a total descent of 2160 metres. After saying farewell to our Explore Leader this morning, we are picked up after breakfast by our experienced driver/guide in Moshi and drive to the Tarangire National Park to start off our game viewing experience. Tarangire National Park is Tanzania's fifth largest park and is named after the life-giving Tarangire River that provides the only permanent water for wildlife in the area. The river is a magnet for wildlife during the dry season when massive concentrations of elephant, buffalo, wildebeest and zebra congregate along its banks. The Tarangire River runs up the centre of the park through diverse habitats and varied topography. Gentle rolling hills interspersed with giant baobab trees, open acacia woodlands and seasonal swamps provide a spectacular and picturesque setting. The most renowned feature of Tarangire is that it serves as a place of refuge for the largest elephant population in northern Tanzania. After a game drive around the park, we continue to the Karatu Forest Tented Camp where we will be spending the next two nights. The camp is in a river-area habitat bordering the Ngorongoro Conservation Area and many birds can be seen and heard here. Our simple fixed tents are shaded by a canopy of bamboo and thatch and come equipped with proper beds and bedding, a table and mosquito nets. The en-suite bathrooms have a flushing toilet and hot shower. Meals at the camp will be prepared in the site kitchen by the camp staff. We leave the camp early and head to the Ngorongoro crater for a full day of game viewing. Ngorongoro is a World Heritage Site and the world's largest intact volcanic caldera, the 600m high walls of the approximately 16 kilometre wide crater create a natural amphitheatre for one of the densest populations of large animals anywhere. In one day it is possible to see a staggering array of East African wildlife including all the big carnivores. The crater lives up to its reputation with abundant and easily accessible wildlife and offers a reasonable chance to see lion, hyena or cheetah in action. After the morning game drive, we take a break to enjoy a packed lunch at the Hippo Pool picnic site before continuing with an afternoon game drive. In the early evening we drive back to the Karatu Forest Tented Camp for the night. This morning we depart the camp at around 0730 and head to the Lake Manyara National Park for our final game drive. Lake Manyara was formed as a result of the Great Rift Valley - over millions of years as the rift grew wider, streams cascaded down its continually eroding slopes and pooled into what is now the famous lake. Lake Manyara National Park is famous for its tree climbing lions and large flocks of flamingos. Lake Manyara also provides the perfect showcase for Tanzania's birdlife with more than 400 species of birds recorded in the area. After exploring around the beautiful lake and its surroundings we drive back to our lodge in Moshi for the final night of the trip. The trip ends today at our lodge in Moshi. Customers departing on early morning flights may need to depart before breakfast is served. The climate is tropical but varies greatly with altitude. Coastal areas and islands are hot and humid, while the central plateau is dry and arid. Tanzania can be visited all year round and its seasons can be defined as green and dry. The dry season is generally from June to October and January to February, with most days being fine and sunny weather with temperatures and humidity rising throughout the day. It can be cold at night, particularly in June & July. The green season includes the rains of March to May (with the peak in April – generally during the afternoon) and November to early December. This pattern can be unpredictable. The weather system during these periods refreshes the landscape creating luscious green scenery which is not witnessed during the dry season. The Zanzibar archipelago is a year-round destination but does have dry and rainy seasons. The dry season is between June to October and January to February. The ‘short rains’ are between November to December, when a short, afternoon rainstorm can be a daily occurrence. The ‘long rains’ occur between March to May, when days can be humid and rainy, however, sunshine is still often frequent. The changing weather patterns does mean the ‘rainy’ season is becoming less predictable. Weather at altitude can vary to the above seasons, with the evenings being cold. Kilimanjaro features its own array of climates and biomes; between 1,800 to 2,800 metres is a rainforest climate (humid and hot), from 2,800 to 4,000 metres is dry mountain vegetation – please note night time temperatures can fall to below 0 degrees from this level. A cold desert climate with a strong equatorial sun during the day but cold nights is found between 4,000 to 5,000 metres. The summit generally has clear days though the evenings can be very cold featuring snow. Additional information and climate charts can be accessed at http://www.explore.co.uk/ weather. Seasonal weather patterns can be unpredictable. Up-to-date information on the weather worldwide can be found by following the BBC weather link on this page. 3 Pin (as per the UK), best to travel with an adapter as some lodges have 2 pin sockets. Being properly equipped is one of the keys to a successful trek. Use the following check list and notes to be sure that you have what you need for the actual trek. Jacket - After sunset, temperatures can fall below freezing. A very warm jacket is the most convenient way of keeping warm when the temperature drops. Down jackets are recommended especially for the summit attempt. Waterproofs - Breathable jacket and trouser waterproofs made from material such as Goretex not only protects against rain and wind, but also stops you from overheating. They 'breathe' and avoid condensation that you will experience from nylon waterproofs. Long trousers - For everyday walking, light trekking trousers are the most suitable. Jeans are not recommended as they are often difficult to walk in over longer distances and become cumbersome when wet. Fleece jackets: Fleece jackets are essential as nights can be very cold at altitude. Make sure that your waterproof jacket is loose enough to wear over your fleeces. Thermal underwear/base layers - Long sleeve tops and long john legging thermal underwear is essential. Cotton clothing like t-shirts are not suitable or recommended as a base layer as they do not wick away any moisture from the skin. In extreme cold, this could lead to hypothermia. It can also contribute to chaffing of the skin in sensitive areas leading to discomfort and skin irritation. Shorts - Shorts can be very comfortable to walk in but you must carry long trousers with you in case you get either sunburned or cold! Waterproof gloves; a warm scarf & a warm hat - Heavy duty windproof gloves or mittens are essential. Also bring a scarf to cover your neck and a warm balaclava or a warm hat. Torso: You should have six or 7 layers of clothing covering your chest depending on your kit specifications. Starting from your base layer to the outer shell, you should wear a long sleeve thermal underwear layer; a comfortable long sleeve shirt; a jersey; a thin fleece; a thicker fleece and a thick waterproof and windproof outer shell that may contain a fleece lining. If you have a down jacket you may want to decrease this by one layer. Legs: You should wear three layers of clothing covering your legs. Starting from your base layer to the outer layer, you should wear long john thermal underwear; trekking trousers and a waterproof and windproof outer shell. Extremities: Your head must be covered by a balaclava or a warm hat and your neck should be covered by a scarf. Your hands must be covered with thick waterproof and windproof gloves. You must have thick clean warm socks for summit night. You might also wish to bring hand warmers for additional warmth for summit night. Most well stocked pharmacies/outdoor stores will have these available. Walking Boots - We strongly recommend walking in a good, comfortable, broken in pair of boots. Trainers and tennis shoes do not give the ankle support afforded by a decent pair of walking boots. Ideally, visit a specialist outdoor pursuits shop who will offer advice. It is a good idea to carry your boots in your hand luggage on international flights or wear them. Gaiters are useful to keep snow and scree out of your boots. Trainers or trekking sandals - You may choose to bring these which will be useful in towns and when travelling, and leave them in Moshi. It is worth bearing in mind that trekking sandals afford you little protection from stubbing your toes when walking around rock-strewn campsites at night. Socks - It is best to wear a pair of liner socks under a pair of fairly thick loop stitch socks. This helps to protect your feet against blisters. Avoid nylon socks, they are abrasive, don't breathe well and can cause blisters. Main Baggage - The item of luggage used to carry all your belongings in the hold of the plane and used to store all of the items you don't need on trek. This can be left behind at the group hotel used prior to the trek. Trek Kitbag - Before leaving Moshi there is time to re-sort luggage into what you need on trek and what can be left in Moshi. Think about what you are taking on trek (remember your sleeping bag) and then think how big your kit bag needs to be. An ex-army type can usually be obtained cheaply. A nylon or canvas bag with a zip along the top is also suitable. Whatever you choose, it must be strong and waterproof, but the porters will carry your kit in heavy duty outer bags for added protection. Soft luggage is essential as framed rucksacks are unsuitable.The weight limit for bag and its contents must not exceed 15 kg but you will probably find that you do not need this much. Daysac/Rucksack: 30-35 litres recommended. During the course of a trekking day, you do not have access to the luggage which is being carried for you by the porters. In any mountain region the weather can change rapidly and you must be equipped for this eventuality. Your daysac should therefore be large enough to carry waterproofs, fleece jacketweater, long trousers (if walking in shorts), warm hat and gloves, sun hat, sun cream, water bottle (minimum 1 litre) and your camera. Most people normally find that this adds up to about 2 to 3kg. Other optional items in a daysac might be a diary or a book to read at lunch time. We advise you to take a waterproof rucksack cover or alternatively line the sack with a large plastic bag to keep the contents dry. You can store bags at our lodge in Moshi if you wish during the trek which you can collect before your safari extension. Sleeping bag - As you do not carry it yourself, this may be down or synthetic, but it must be 4-season comfort rating (temperature -10 degrees celcius to -5 degrees celcius) or a 3-season with a separate liner. A silk or fleece liner helps to keep your bag clean and adds an extra season. Sleeping mat - Whilst Vaude sleeping mats are provided, they are lightweight and thin. We therefore recommend that you bring your own inflatable thermarest for added comfort and a good night's rest. Sleeping aids - Some people find it difficult to sleep at altitude. You may find ear plugs and an eye mask useful at night. Trekking poles - Strongly recommended. Water Bottle or Platypus/Camelbak hydration system - During the trek you will be supplied with filtered water each morning in camp but this will still need to be purified. A personal supply of tablets/drops (approximately 40 tablets) for your water purification system is essential and should be brought with you as they are not easy to find in Moshi. Powdered fruit juice can be used to disguise the taste and this can be purchased in Moshi. Water along the trail must never be considered as drinkable until purified. Take at least 2 x 2 litre personal water bottles or a system that allows for this much water. If you elect to use a hydration system with a tube then it is essential that the bladder and tube are insulated for high altitude and below freezing temperatures. Sunglassesnow goggles - Essential for protection against UV rays and glare at high altitudes. Sun hat, high factor sun cream/block & lip salve - Choose a high factor suncream (factor 30 or more) to protect your skin against the sun at high altitudes. A combination sunblock/ lipsalve is ideal for facial protection. Torch/batteries/bulb - A head torch is essential at night in the camp and for lighting your way on the night time summit ascent. Bring plenty of spare batteries and a bulb. There are no facilities on the mountain to recharge any digital equipment. Toiletries - Essentials are toothbrush/paste. Wet Wipes are great for an alternative to washing and a quick clean up. Personal first aid kit - On each trek a first aid kit is carried but you should have your own blister kit, supply of plasters, aspirin and other essentials. Please do not give medicines to local people without consulting the tour leader. Personal supplementary snacks - Although sufficient food is supplied on this tour, we recommend that you bring some high energy snacks like cereal bars and chocolate (sweets if you are lactose intolerant) with you. Dextrose and mint cake are especially good for summit night. Swimming costume - the hotel in Moshi has a pool. Two man tents, dining tent, toilet tent and all cooking and kitchen equipment are provided by Explore once you are on the trek. Drones - Are not permitted in any National Park in Tanzania without a permit. Permits cost approximately US$250 per 24 hrs. Please advise us at time of booking if you wish to take a drone with you into the National Park, as permits are difficult to obtain. If you launch a drone without a permit this will be confiscated by the Park officials. After consultation with local porter protection groups and our agent in Tanzania, you should accordingly allow US$150-165 per person depending on group size for group tipping on this tour. It would be advisable to have this amount in denominations of 5,10 and 20 dollar notes for ease of distribution. Banks or 'Forex' offices only in main towns/cities. Your Tour Leader will advise you on arrival. Major towns and cities will have ATMs available. Credit cards are generally not accepted. Take some to act as reserve funds. Our Kili trek is camping based and, as you may expect, conditions are basic on the mountain, though the service from our porter team is superb. We use two man tents which will be put up and taken down by our porter team. A mess tent is provided where we take breakfast and dinner as well as tea and refreshments at the end of each days trek. We carry portable chemical toilets and a toilet tent and there are also basic long drop toilets at each campsite. There are no permanent washing facilities at the camps and a limited amount of water is available for washing so wet wipes come in very handy! In Moshi before and after the trek we stay at the comfortable Weru Weru River Lodge which has an outdoor swimming pool and great views of Mount Kilimanjaro on a clear day. On our safari extension we stay at the Karatu Forest Tented Camp. Conveniently located for easy access to the parks we visit, the camp is in a river-area habitat bordering the Ngorongoro Conservation Area and many birds can be seen and heard here. Our simple fixed tents are shaded by a canopy of bamboo and thatch and come equipped with beds and bedding, a table and mosquito nets. The en-suite bathrooms have a proper flushing toilet and hot shower. Meals at the camp are prepared in the site kitchen by the camp staff. Tanzania: A single visa is required by UK, New Zealand, Australian, US & Canadian citizens. Visas can be arranged on arrival, but due to queues at immigration we recommend for the visa to be arranged in advance. An E-visa for Tanzania can be obtained prior to departure via the e-visa website: http://www.immigration.go.tz. Click on the e-Services tab and then select Online Visa Application, please ensure you read the Visa Application Guidelines before applying for your e-visa. You will need to print a copy of your e-visa approval letter and present this with your passport and final documents at your entry point into the country. The approval letter takes approximately 10 days to approve if there are no queries on the application. We therefore advise for you to apply at least 15 workings days prior to travelling. Please ensure you have enough validity left on the visa through to the end of the tour before you travel. American nationals are required to apply for a multiple entry e-visa for all tourism visits to Tanzania; the ordinaryingle entry e-visa is unavailable for Americans to apply to. Passports must have a minimum validity of 6 months and at least 1 blank/unused page at time of travel. Travellers with heart or lung conditions, anaemia, asthma, high blood pressure, or taking the contraceptive pill must seek the advice of their GP and specifically mention the maximum altitude this trip reaches - 5895m. Please take these to your medical appointment so that your doctor has the full details of your trip. You must have adequate travel insurance for your trip. Please ensure that your insurance policy covers you to the maximum altitude indicated above. If you have Explore insurance you will be covered to this altitude. This trip includes night stops where we sleep at altitudes in excess of 4000m. For this reason it is suitable only for participants aged 16 and over. As part of our Responsible Tourism program, we support the 'Donate a Mosquito Net' charity. This scheme purchases mosquito nets from a local provider and donates the nets to villages in areas that are most affected by malaria. The nets cost US$3.00 each and your leader will advise how you may donate if you wish. We strongly recommend protection against malaria, hepatitis A, tetanus, typhoid, polio and yellow fever. Please note you are required to produce a valid yellow fever certificate on arrival in Tanzania if you have spent 10 hours or more transiting through an endemic country. Consult your travel clinic for latest advice on different prophylaxis available against malaria. Travellers may also wish to take immunisation against meningococcal meningitis. Please check the latest requirements with your travel clinic or doctor prior to departure. The above is not an exhaustive list. Further information regarding vaccinations and travel health advice can be found by following the NHS and NaTHNaC links at Explore Travel Health and from your local healthcare provider. Visa and vaccination requirements are subject to change and should be confirmed by you before travelling. This is an 8-day trek with an average of 5 to 7 hours trekking each day, except for the ascent of Uhuru Peak which involves 12 to 14 hours of trekking. Generally we walk at altitudes between 3,000m and 5,000m and we reach a maximum altitude of 5,895m. The trek is fully supported by porters and staff. We have graded this trek as Challenging to Tough. What's it like to climb Kili? Read the blog by Adventure Travel Consultant Sarah Jayne to find out.